I did something I never do. I spent a whole day crafting! Yesterday I sat at my desk and completed three cards. Now, granted, I have a pre-schooler in the house so it was not uninterrupted craft time, but it was still quite the luxury. I thought I'd share the first of those cards with you today. A co-worker requested a special order "just because" card for his wife (on a referral from another co-worker- word gets around, I guess). I always ask a little bit about the recipient before I do a custom job. This time I learned that she loves wine and her Shih Tzu. I sat with this info for a few days before I came up with a plan. I knew I didn't have an image for either of her passions so what's a girl to do? Shop, of course! I visited Mo's Digital Pencil for her image Party Girl and then popped over to Tiddly Inks for the adorable Kiki freebie. Both images are colored using Copics. I fussy cut Kiki (then popped up on foam squares) and used the Long and Scalloped Long Rectangle Nestabilities to cut and mat my Party Girl. 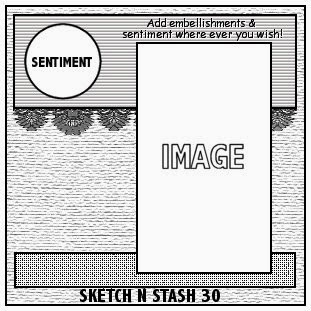 I selected the current Sketch n Stash (#134) as my layout. I'm in the beginning stages of a craft room overhaul and I've made a promise to myself that I need to use more of my items. If I don't use it, it should go to a new home. This is a great motivator to use some items that I may have been overlooking. The Eiffel Tower Die-namics from My Favorite Things, for instance. Or the Martha Stewart crown punch. I also grabbed that pretty lace from my stash as well as a Gina K sentiment from the Lovely Labels set, stamped on a Lacey Circles Nestabilities from Spellbinder that was sponged with Stampin' Up Rose Romance classic ink. Flowers are from my stash too. Papers are Basic Grey - True Love. I felt a little guilty that I took all that crafty time for myself, but sometimes it's just the thing a creative girl needs. I still spent time with Kayne and since my craft room is next to the living room (and is also his play room) we were still together all day. The other two cards I have to wait to reveal as they are birthday cards that have not yet been delivered. I have some more amazing news to share that is craft related, though! I had one heck of week last week when it came to prizes! First I won that amazing custom clock giveaway from Saturated Canary. THEN I won the hair and skin coloring class from Kit and Clowder, the new online coloring community started by the insanely talented Alyce Keegan! I couldn't be any more excited about both prizes! Maybe I should have bought a lottery ticket, huh...? Thanks for the visit, and I hope your week is off to a fabulous start! Markers used: Copics (E00, E11, E21, R32, R39, R89, BG10, BG72, Y28, N0, N2, N4, N6, N8). Fabulous card and so fun. 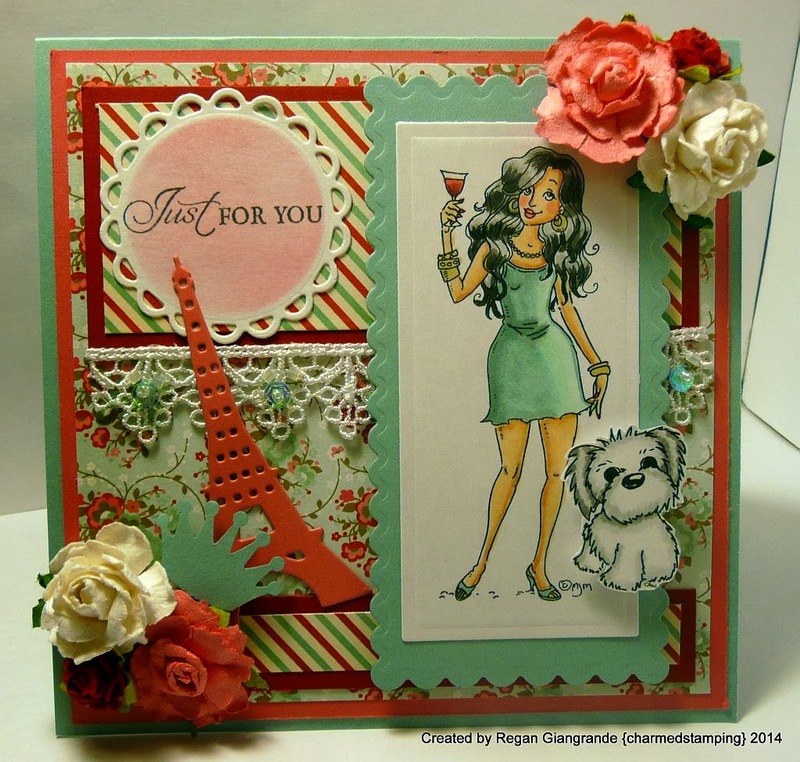 I love the way you have colored the images and added the Eifel tower, wine and France go together so well. Great job Regan. This is so pretty, inside and out, Regan! 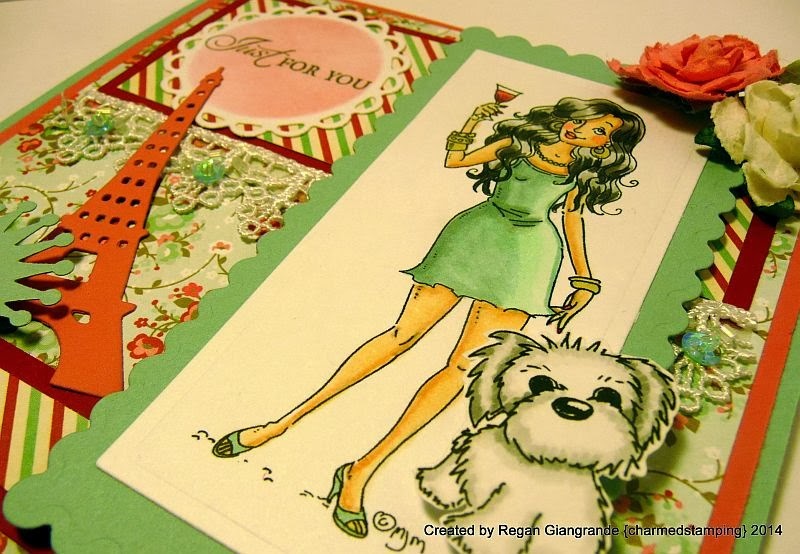 I love the beautiful paper and the colors you've used! Thanks for joining us in Mo's Challenge! Love this card! The elements and layout are fantastic! Hi, what a gorgeous card!! Love the layout and all the die cuts you have used. Just Beautiful. Thankyou for joining us at That Craft Place. Good Luck and hope to see you again soon. Fabulous design. Love all the additions. I love how sophisticated this card looks! Great job!